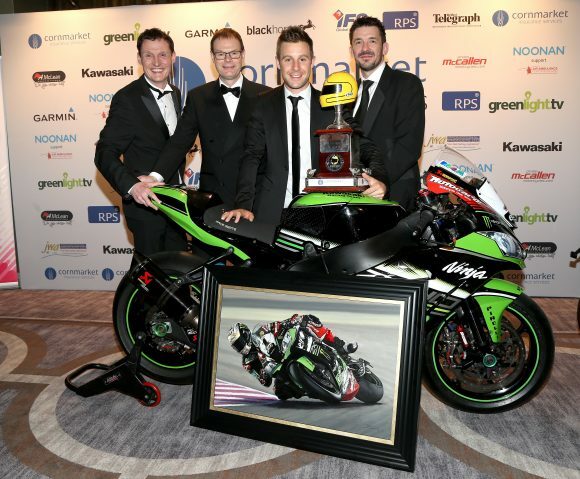 Double World Superbike Champion, Jonathan Rea, was honoured last week as he was presented with Kawasaki Motors UK’s ‘Outstanding Achievement Award’ by Howard Dale, General Manager of Kawasaki Motors UK and Craig Watson, UK Sales Manager. Howard and Craig flew to Ireland to hand over the award from Kawasaki Motors UK. As well as the award, Jonathan was presented with a specially commissioned oil painting too – showing a scene from the final race of Jonathan’s triumphant 2016 WSBK campaign, under the floodlights of Qatar wearing his celebration design Arai helmet. From this unique painting, 165 limited-edition prints have been created – none of which will be sold – however, customers who pre-register to attend Kawasaki’s 2017 New Model launch night on Friday 24 February could be in with a chance of winning one. Each Kawasaki dealer will have one limited-edition print each to present. Simply visit to register for the event: www.getevencloser.co.uk. Each print is numbered and comes with a letter of authenticity. The first round of the 2017 World Superbike Championship begins at Philip Island, Australia, on February 24-26.